"Passive House: a design method, not a standard"
The second Italian Passivhaus Conference took place at the Made Expo in Milan on 5 October 2013. 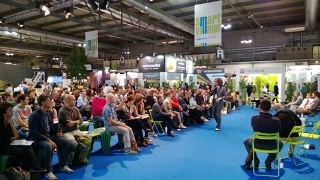 Entitled "Passive House: a design method, not a standard", the conference was held within the "Smart Village", a 2,000 square metre area at the Made Expo’s International Exposition dedicated entirely to sustainability and energy efficiency. The conference, moderated by Francesco Nesi, director of the Italian Passive House organisation ZEPHIR, was a great success, More than 800 people came to listen to the series of renowned architects and researchers present the latest experiences and findings, including those gleaned through the PassREg project. Innsbruck, 11 October, 2013. On 9 October, decision makers from across Europe gathered in Innsbruck, Austria, to learn from the region's Passive House success stories spurred on by strong government financial support on a regional and municipal level. On the following day, the group visited various Passive House buildings in and around Innsbruck to get a first-hand look at the success story the city has to tell. Social housing projects such as the Lodenareal with its 354 Passive House apartments left a lasting impression on eager group members hoping to push Passive House in their own regions. Qualified designers and craftspeople are key to the large scale implementation of Nearly Zero Energy Buildings. Within PassREg, existing courses for Passive House designers and tradespeople, previously developed by the Passive House Institute, are being translated into various European languages and adapted to regional climatic conditions and building traditions. In order to ensure that these trainings will be rolled on a large scale and beyond the duration of the PassREg project, future course providers from different EU countries are being trained to hold these courses throughout Europe. The first round of “Train the Trainer“ courses was held in Antwerp (Belgium), Cesena (Italy) and Sofia Bulgaria between March and June 2013. All those interested in becoming accredited Passive House Designer and Tradesperson Trainers themselves are invited to contact iPHA at info@passivehouse-international.org. The latest project findings will be presented in Catania, Italy on 22 March 2013. This regional PassREg conference, put on by the Italian project partner eERG Politecnico Milano (Polimi) and the PassREg Region Provincia Regionale di Catania in cooperation with APEA (Agenzia Provinciale per l’Ambiente ed l’Energia della Provincia di Catania), will feature presentations by key project players such as Lorenzo Pagliano from Polimi, Carmelo Sapienza, designer of Sicily’s first Passive House (see Passive House database – ID 2123), and a variety of local energy experts and decision makers. The conference will also include a keynote by Wolfgang Feist, director of the Passive House Institute (project coordinator), who will travel to Sicily to attend the conference, meet with project partners and other important Passive House stakeholders and visit innovative projects in the region. Download the conference programme (in Italian). Within the European Sustainable Energy Week (EUSEW), taking place from 24 - 28 June 2013, PassREg and Brussels Environment (IBGE-BIM) in association with REVOLVE Magazine, will demonstrate how highly energy efficient buildings and renewables offer an ideal solutions to meet European NZEB objectives. Participants will have the opportunity to join a half-day study tour visiting examplary tertiary buildings including offices and schools. The Passive House Institute and iPHA were present with a booth at the 2013 BAU, one of the world’s leading trade fairs for architecture, materials and systems. iPHA took advantage of this giant, international construction fair, held from 14 - 19 January 2013, to present the Passive House concept along with the PassREg project. 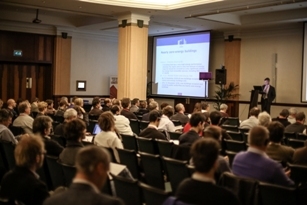 On 5 October 2012, the PassREg partners Passiefhuis-Platform and Plate-Forme Maison Passive organised the eleventh edition of the PassiveHouse Symposium in Brussels, Belgium. Founded to facilitate the exchange of ideas, knowledge and progress in the field of energy efficient construction, this event is the largest symposium on passive and zero energy construction in the Benelux, offering a platform for stakeholders from all over Europe to share their experiences. In 2012, over 300 participants gathered for this symposium to learn about new developments and discuss the latest technologies and research findings. The event rounded off a 4-day PassREg programme, including a partner meeting, a PassREg workshop and study tours (read more here). The symposium featured a keynote speach by Gordon Sutherland, Senior Project Officer at EACI (Executive Agency for Competitiveness and Innovation) explaining the project's role within the EACI supported activities for the uptake of Nearly Zero Energy Buildings in the EU.